Today, we return to The Edinburgh Magazine and Literary Miscellany, Volume 82 (1818). 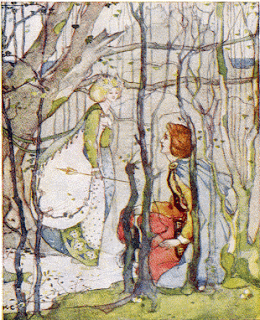 This time, the mysterious CTCS tells the tale of the Fairy Court’s hunt. 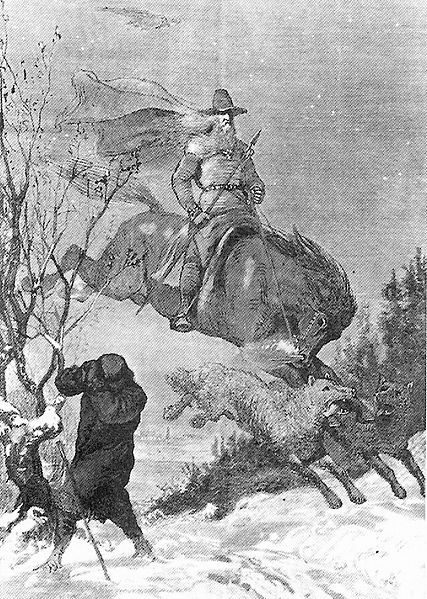 In rich dialect, he relate stye story of an elderly man who encountered the Wild Hunt when he was naught but a lad! Hunting appears all along to have been a favourite amusement of the Seelie Court, and innumerable are the stories which are told concerning the magnificence and splendour of the royal retinue. Amidst all the numerous and gorgeous train, the sovereign was easily distinguished by his stature and majestic demeanour. Upon his right hand rode Her Majesty, and upon the left Kilmoulie, a personage of rather a suspicious character, being, according to some accounts, the resident envoy from the Court of Hell, while, according to others, he was a prime noble among the fairies themselves, of rather a mischievous disposition, and the principal instigator of all their roguish tricks. Be his character or office what it may, he was readily known from his riding a large and powerful black charger, while all the rest of the company in which he ranked were mounted upon very little milk-white horses. 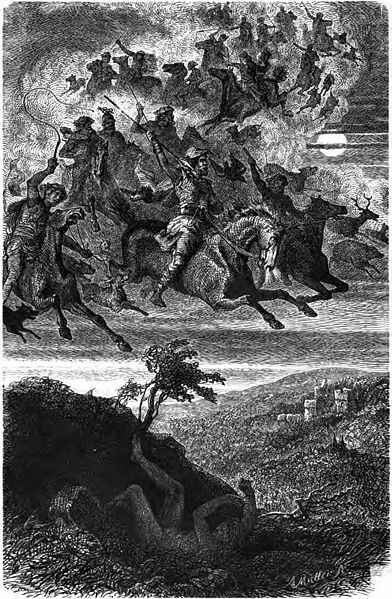 The Fairy Court always rode out in three bands, - the first mounted upon brown horses, the second upon grey, and the last, which contained the king and queen, with the chief nobles, mounted upon horses white as the driftit snaw. It was in this last company that Kilmoulie cut so great a figure, and I forgot to mention, in its proper place, that this high dignitary and his charger, contrary to all rules of optics, appeared to be full as big at a distance as near at hand. Just before my window, and within two or three minutes walk of the door, lies a beautiful sloping field, called Auchreoch, where a peasant who died not many years ago had the fortune to witness the magnificence of a fairy raid. I knew the man when I was a boy, a steady and sincere Christian, at the venerable age of ninety -two; whose mind was deeply imbued with the superstitions and freitty observances of his native land. With supreme interest have I often listened to the excellent man, while he, seated on an old high-backed chair, with his palsied head, which he supported by leaning his brow on a short staff, almost bowed down between his knees with age, narrated, with strong feeling, and in the picturesque language of former days, many a striking relation of the malignant kelpie, the boding wraith, the spiteful witch, and the mischievous but elegant fairy. In one or two of the following little stories, I shall preserve as much as possible of the original language, in order to give your Scottish readers a specimen of the Clydesdale dialect. “In the afternune of a braw hairst day about sun-settin’, an’ as the mune was wadin’ up through an eastlan rowk, the haill bune saw a wee bit crynit lukin’ woman, nae heicher nor a waterstoup, and bussit in a gown o’ the auldest fasson, gang daunerin’ through amang the stouks. Sho cuist mont a lang look at the shearers, but we ne’er luit on that we saw her, though ony body wad, in a moment, hae seen that it was something wanearthlie. The shearers quat rather suner that nicht nor usual, my brither an’ I taiglit a while ahin’, ettlan to fetch hame a draucht o’ green com to the ky. The mune be this was shinan clearly abune a’ the ure, an’ ha’in buggen the draucht, my brither tuke the naig be the head, to lead him hame, whan, till our amazement, we perceived him to be a’ lashan wi’ sweat. Nowther fleechan nor whippan could mak him mudge a fit; but there he stude, quakan, lith an’ limb, like the leaf o’ the lin. While we war stannan upo’ stappan-stanes, switheran what to do, we war suprisit wi’ the soun’ of an onkennable numraer of sma’ bells a’ tinkle-tinkllan. In a doup, by cam thousan’so’ milk-white hunds, naebig ger nor whittrets, an’ souchan as gin they had been a flaucht o’ dows. Mony a wearie company o’ wee wee gerse green riders cam neest, stennan owcr the lea; their graith a’jinglan wi’ siller, an’ their clais skinklan i’ the wanyoch mune as though they had been just ae diamon’. Muckle din an’ loud gilraivitch was amang them, gaffawan an’ lauchan. They rade furth in three wheens; the first muntit on black ponies, the neest on grey, an’ syne the last on bonnie wee beasties white as the driftit snaw. I could brawlie observe the king amang the lave, wi’ the queen on his richt, an’ coal black Kilmoulie on his left. 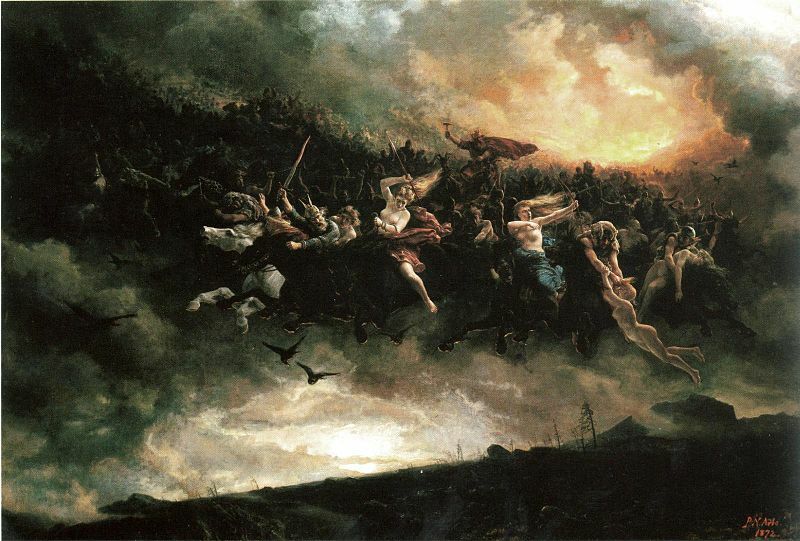 Be this the fore-en’ was tint frae view, amang the brurnie knows o’ Daiberdillie, an’ we war glowran at the sicht, whan he on the richt o’ the king wheelit roun’ his beast, an’ rade straucht to whar we war stannan. He held his richt han’ ower us, crunan out some fleyfu’ words as he gade souchan by like the wind. Whan we cam till oursells a’ was gane thegither, an’ the cart was stannan cowpit up on its hin’ trams, but no ae bit o’ the graith was lowsit. Aff we set, gey an’ sare fleyit, to seek the beast; and as we war gaun by a sauchen buss in Glenaskie, we thocht we sawsoinetliing white in the buss, an’ heard it gurr gurran like a dog shoran to bite. We gade ncrrer to see what it was, thinkan it micht be a hown’ worryan a lamb, whan out cam sic a smytrie o’ wee white dogs as ee ne’er saw. The hale o’ Dumtersie was perfectly cu’rit, an’ the lift rang again wi’ their gowlan. 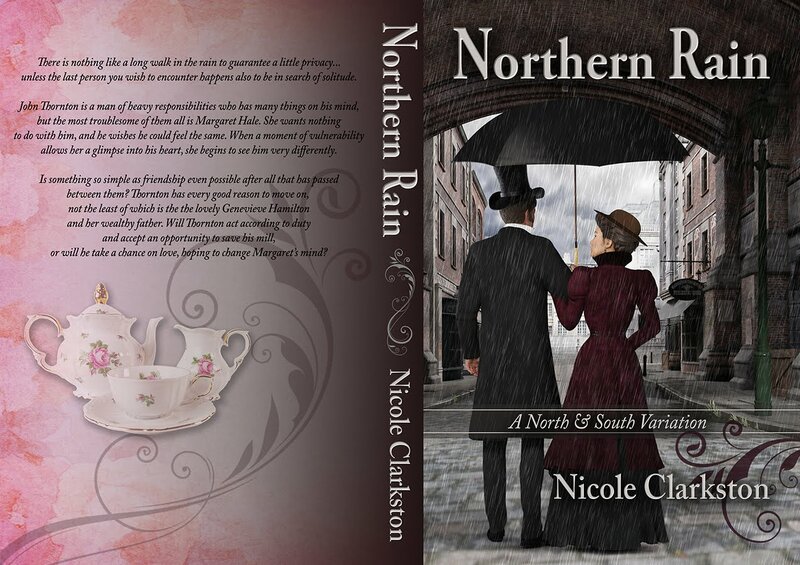 I am so excited to welcome Nicole Clarkston, author of Northern Rain, to the salon. Although we don't often time travel forward to Victoria's era, Nicole has kindly offered to enjoy a cuppa and share the tale of how Mrs Gaskell has inspired her. Don't miss the giveaway at the end of the post, open to all who leave a comment! I want to thank Catherine for so graciously welcoming me to her lovely blog, celebrating the magnificent 18th century. It is a delight to consider the profound effects of yesteryear on our world today, and to share that fascination with others. As a mom, I have the privilege of pouring into three young lives on a daily basis, and one of our favourite enjoyments is a good historical fiction read. We delight in the way history comes alive in our imaginations. It lends context, putting flesh on the people we read about and kindling a passion for the world which existed long before we did. When I started writing my own historical fictions, I knew that I had to weave some of reality into my stories. 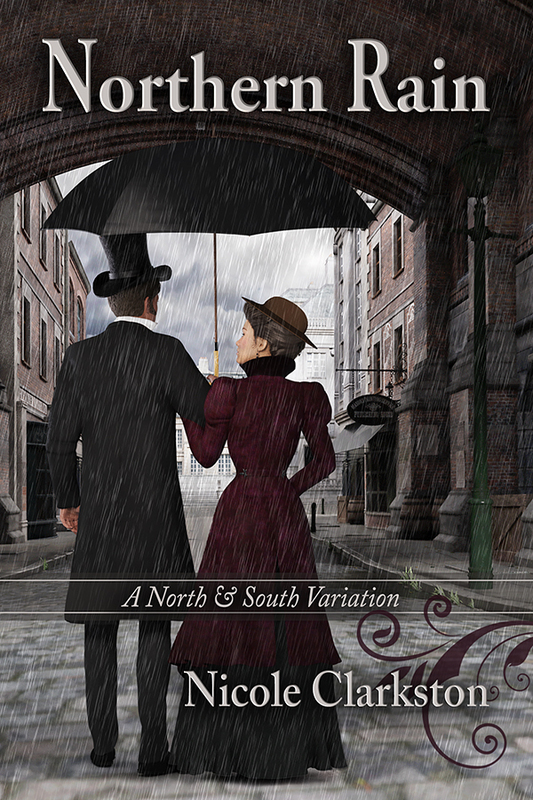 Elizabeth Gaskell first published North & South in 1854, at a time when life was speeding up for the entire world. Cities were booming as people without prospects in the country began to realize that a job awaited them in the factories. We all know the story- industrialization made life cheaper, and yet more expensive. Home life changed, thought and politics changed, and the face of the world became at once brighter and also harder. In writing a story set in this time, the absolute richness of the historical material was overwhelming. The characters did not live or love in a vacuum, so shining the light of the facts of the day on their story breathes life and depth into their motives and pressures. I tried to pay close attention to the calendar and the real events of the time. The story opens, for example, on Tuesday, October 17, 1854, on what I randomly chose as the seventeenth anniversary of John Thornton’s father’s suicide. One of the most sweeping events I chose to highlight in this book is the Crimean War. Very early in the book, Thornton and a few other gentlemen are discussing the Battle of Alma, which had taken place less than a month earlier, on September 20. This had been a notable British victory, and could be credited in some small part to the more accurate modern weapons carried by the British soldiers. This was a minor discussion point among the characters, as John Thornton was an ardent proponent of industry and its potential, and here was yet another example of its benefits. As a result of this battle, Russian forces were forced to withdraw to Sevastopol, and a siege began. A week after the conversation in the book, on October 25, the Battle of Balaclava took place. Shortly after that tragedy, the gentlemen are again discussing war and politics. I chose not to make this a major plot point in the story, but I hoped to subtly demonstrate the world-wide influences on Thornton’s business, and how events on another continent could affect British industry. This is the last time the war is openly mentioned in the novel, but it is to be hoped that the reader is left with an impression of the intricate balance of economies at play. Not long later, Margaret takes up an interest in a charity whose purpose it is to attract subscriptions to build a hospital. It was not an uncommon practice to solicit the support of the wealthy for charitable causes. Elizabeth Gaskell herself often employed her own connections to raise funding for such enterprises. There is another minor plot turn when Margaret discovers that the advising doctor connected to the new hospital is actually a quack (and yes, that is a legitimate term for the day! It derives from the medieval “quacksalver”). Margaret then mentions Dr Snow and his research, which was another interesting development of the time. In early September of 1854, a cholera epidemic had broken out in London, and Dr Snow’s diligent tracing of the disease back to a contaminated pump handle in Soho became the basis for modern epidemiology. Now, in this, I confess, I took a little creative license. Margaret would probably not have known about Dr Snow’s findings for a few more years, as they had not yet been published, but the events and the beginnings of the research had, indeed, taken place by the time the story unfolds. I also tried to incorporate details about John Thornton’s mill, and what the state of technology likely would have been. At one point he wishes he could have afforded to upgrade to a Heilmann Comber, which was one of the newer systems of combing cotton at the time. I had a little fun with this, because it was very quickly an obsolete technology- being bested by the French combers very soon after- but to me, it simply highlighted how quickly everything was starting to change in the industrial world. Industrial accidents were a big deal, and still are. The looms were driven by an overhead belt, powered by a steam engine with a boiler. Boilers were known to explode, causing dreadfully catastrophic damage. Fires could break out, buildings were brought down by the pressure, and many were killed. In only one example, in 1855, Fieldhouse Mills of Manchester suffered a boiler explosion. Ten people were killed, and thirteen injured. I did not feel it was a stretch at all for Thornton’s mill to suffer such a calamity- in fact, the main part which could be said to be inaccurate was the rather less significant loss of life. By the end of the 19th century, most boilers had tamper-proof safety valves, but that would not have been the case for Marlborough Mills. Later in the story, Thornton and another character are caught in a heated exchange about the future of manufacturing in Milton. The other character urges Thornton to consider the potential changes coming to the industry with the awakening of American sentiments regarding the slave-owning cotton plantations. Our characters could not know this fact, but within only a few years, the cotton industry would be shaken by the American civil war. Smaller British mills struggled to survive in the wake of higher cotton prices and the increasing scarcity of raw material. By 1865, the weaving industry had begun to centralize around the larger operations- and Marlborough Mills was large enough to be one of those survivors, if the buildings and equipment evolved to keep up with changing times. Elizabeth Gaskell’s writing is so remarkable to me because she manages to weave a haunting love story into a raw, gritty industrial treatise, but she does not stop there. She also establishes herself as an accomplished academic and an informed moralist. Thornton, Higgins, Mr Hale, and even Mr Bell regularly trade their very diverse insights on life, and I love the perfectly balanced perspectives that each brings. They are like four corners of a bargaining table. Between the four of these characters, we have one very brilliant, enlightened individual. Interestingly, Gaskell does not withhold Margaret’s input into these conversations. She challenges and questions, and even when she proves herself naïve and uninformed, she easily wins the respect of all four very male counterparts with her thoughtful, passionate opinions. I could not possibly play with Gaskell’s great work without bringing up some of these conversations on ethics. Had I wished for the book to be half again as long, I would have explored them even further! Most of the interplay I highlighted was between Mr Hale and Thornton, and I had an ulterior motive. Gaskell’s Thornton was a man of self-sacrifice and responsibility, and through Mr Hale’s Socratic teaching method, I suggested that Frederick Hale had suffered those same burdens. There are many takes on Frederick’s actions- perhaps he was too impulsive and prejudiced against the figure in authority over him (Margaret and even Thornton, to an extent, share a little of this flaw). Perhaps he felt compelled to sacrifice his own future to do what was right (again, Margaret and Thornton). Either way, Mr Hale with his failing physical health begins to struggle for mental clarity, and inadvertently confuses his favourite pupil with his son. The emphasis on Thornton’s own sense of duty was important, because it exacerbated the conflicts later in the novel which kept him and Margaret apart. The last little historic tidbit of note goes back to the calendar. The epilogue unfolds exactly two days after the initial scene in the novel, on October 17, 1856. This time, the date falls on a Friday. Why? Well, my dear friends, 1856 was a leap year. I have immensely enjoyed dipping into history with my pen. Along with important information, I naturally collected a fair bit of random data, with which I was regularly able to amuse my family. History has become an obsession in our house, and it is a delight to be able to bring a small corner of it to life. There is nothing like a long walk in the rain to guarantee a little privacy… unless the last person you wish to encounter happens also to be in search of solitude. John Thornton is a man of heavy responsibilities who has many things on his mind, but the most troublesome of them all is Margaret Hale. She wants nothing to do with him, and he wishes he could feel the same. When a moment of vulnerability allows her a glimpse into his heart, she begins to see him very differently. Is something so simple as friendship even possible after all that has passed between them? Thornton has every good reason to move on, not the least of which is the lovely Genevieve Hamilton and her wealthy father. Will Thornton act according to duty and accept an opportunity to save his mill, or will he take a chance on love, hoping to change Margaret’s mind? 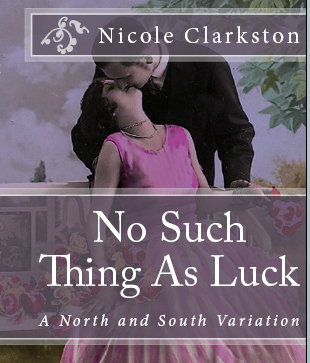 Nicole Clarkston is the pen name of a very bashful writer who will not allow any of her family or friends to read what she writes. She grew up in Idaho on horseback, and if she could have figured out how to read a book at the same time, she would have. She initially pursued a degree in foreign languages and education, and then lost patience with it, switched her major, and changed schools. She now resides in Oregon with her husband of 15 years, 3 homeschooled kids, and a very worthless degree in Poultry Science (don't ask). Nicole discovered Jane Austen rather by guilt in her early thirties- how does any book worm really live that long without a little P&P? She has never looked back. A year or so later, during a major house renovation project (undertaken when her husband unsuspectingly left town for a few days) she discovered Elizabeth Gaskell and fell completely in love. 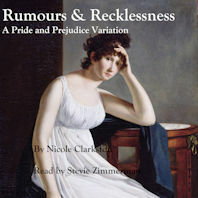 Nicole's books are her pitiful homage to two authors who have so deeply inspired her. (The date is correct for the review at The Calico Critic. It will have a separate giveaway as the ‘official’ blog tour ends on the 26th and its giveaway will end on July 28th. Rafflecopter Giveaway: This giveaway is for 4 Paperback copies and 4 eBooks copies of Northern Rain. Two audiobooks of Rumours & Restlessness, Ms. Clarkston's P&P novel, and two audiobooks of No Such Thing as Luck, her first N&S novel, are also included in this giveaway. There will be twelve lucky winners! Winners will be posted at the end of the blog tour and all stops along the way are included in the giveaway. Be sure to visit all and leave your comments. The giveaway ends at 11:59 PM on the 28th of July. Written content of this post copyright © Nicole Clarkston, 2016. During my infancy, it was the custom, at rockings, to entertain each other with stories of apparitions and unearthly visitations; a numerous collection of fairy tales, also, formed part, and no inconsiderable part, of the general amusement; and he was esteemed the most acceptable rocker, whose memory was most plentifully stored with such thrilling narratives. But a very great change has taken place within these fifteen years, the date to which my recollection reaches. The inhabitants of Clydesdale, for I speak of that portion of Scotland only with which I am most intimately acquainted, in place of frequently meeting and entertaining each other with the romantic traditionary lore of former times, seldom have any merry meetings at all; and when one does happen to take place, the conversation even of the very youngest persons present is either about the shortest and surest way to riches, or else consists of puerile scandal concerning absent lads and lasses. With extreme interest and with delight, mingled with piercing terror, have I formerly listened, however, every night for weeks and months to these fearful tales; and as my memory is pretty deeply imbued with the mythology of at least my native county, if it be consistent with the plan of your Magazine, I shall tend you from time to time a short account of the Fairies, Brownies, Witches, Kelpies, &c. who still linger amongst our hills and glens, as loth to forsake that beloved land wherein they formerly reigned so long with unquestioned dominion. 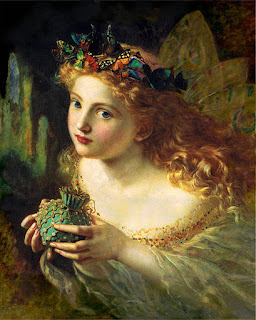 The first of my little essays shall be upon the Fairies; but I must be permitted to observe, that after the detailed and extremely interesting memoir on the fairy superstition introduced into the Minstrelsy of the Scottish Border, it would be a presumptuous work of supererogation in your humble correspondent, as well as a thankless labour, were he to attempt to give a fuller or more explicit account of this most elegant branch of our national mythology. 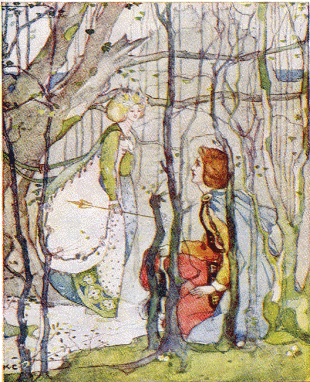 But notwithstanding all the multifarious anecdotes which the indefatigable industry of Mr Scott has collected, several curious traditions have escaped his search, which tend in some degree to shew, that the opinions of the “people of the west” concerning the Fairy Folk, though in general agreeing with those of the romantic borderers, yet differ from them in various particulars. As white as the driftit snaw. An’ currooit the trees amang. Brast furth the mornin’ sun. Come out of a birken bower. Soup’t doun alang the grun’. As muv’t by a whirlwin’. Thomas rather ungallantly persists in refusing to comply with the request of the queen, though her Elfin Majesty presses her suit in terms which I beg leave not to be compelled to repeat. The virtue of Thomas is inflexible, till at last the princess offers him her hand, and along with it her crown, with perpetual sovereignty over Fairy Land. In joy an’ grit renown. 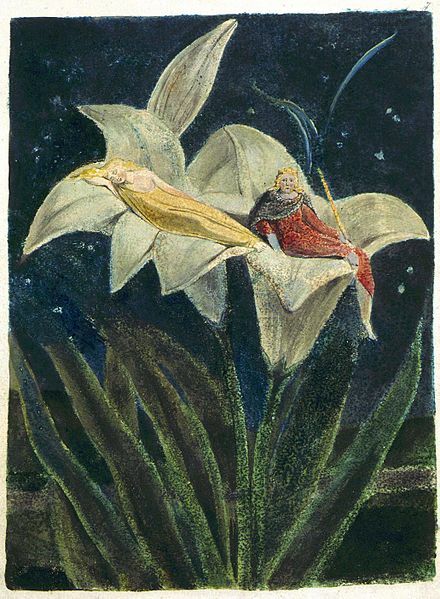 These were no doubt alluring offers, and the temptation, as was to have been expected, proved too powerful for the virtue of the poor Rhymer, who from thenceforward became King of the Fairies. Next week, we return to Clysedale for more tales of the fairies! I'm delighted to welcome my regular guest, Avellina Balestri, to discuss the relationship between Braddock and Washington. The British General Edward Braddock and his young colonial aide George Washington are often portrayed as symbols of the antagonism brewing between Britain and her Colonies during the French and Indian War, which would soon burst forth in the form of the American Revolution. This is partly true, but their relationship and the relationship between Britain and America were and are much more complex than has often been portrayed in grade school history texts and Hollywood motion pictures. There was also something deeply human about their interaction that is often overlooked in favor of a more easily understood narrative that chooses sides rather than seeks out the middle way. In February of 1755, Edward Braddock, a 62-year-old veteran of the prestigious Coldstream Guards and native of Perth, Scotland, was sent to North America to ostensibly “put the French in their place” and push them further west to make room for the expanding British colonies in the Ohio River Valley. The colonists themselves were enthusiastically behind this push for supremacy, and initially welcomed the regular troops sent from the Mother Country to aid them in the territorial struggle, known as The French and Indian War in America and The Seven Years War in Europe. But problems arose almost immediately, involving the proper accoutrement of these newly arrived troops and misunderstandings on both sides. The British viewed the colonists, by and large, as low-life opportunists who tried to get best edge on every deal and refused to obey orders or conform to disciplinary regulations. The colonists, on the other hand, resented the pompous and bullying attitude of the British officers, including Braddock, who refused to acknowledge that the Americans could ever stand on equal footing with them in social, political, or military spheres. Nevertheless, both sides realized it would be mutually advantageous to put up with one another in order to successfully overthrow the common enemy. In the process, a variety of interesting Anglo-American relationships were forged, turning some people into long-time friends, some into long-time enemies, and others into something in between. Still, “all for one and one for all” proved easier said than done in the majority of these instances. Meanwhile, Colonel George Washington, a 23-year-old officer in the first Virginia Regiment, was just coming off the disgrace of firing on French dignitaries, losing control of his tomahawk-wielding Indian allies, and getting bottled up in his ill-constructed, valley-based Fort Necessity. He managed to get out of the jam only after promising the French commander he would stay off the field of battle for a year. But then General Braddock selected him to be one of his aides. Maybe, in spite of Washington’s past blunders, Braddock saw a spark of talent in the young man and wanted to be the one to bring it out. The general soon took to mentoring Washington in the methodical and oft times brutal ways of the regular British army, in which soldiers were often flogged within an inch of their lives for minor offenses, and strict discipline ensured that they were a feared fighting machine on the fields of Europe, with precision and coordination to match their best continental competitors. And yet in America, frontier warfare required more flexibility and imagination to meet with success, especially when facing off against Native American tribesmen. Braddock was an regular officer of the old school, who was adept at teaching but loathe to learn anything new. These contentions were to be brought to a head as they set out to capture Fort Duquesne in Western Pennsylvania so that the British would have a stronghold in the Ohio River Valley. On July 9, 1755, as the British troops marched towards Fort Duquesne, Washington was feeling sickly from a nasty bout with dysentery, and Braddock advised him to keep to the rear for the sake of his health. But Washington was determined to stay where the action might be, perhaps in order to redeem himself as a fit officer. Also, he seemed to have hopes of convincing Braddock to alter his tactics to better fit the North American theatre. But the general’s ego would never allow him to even consider taken advice from a subordinate colonial, and he bellowed that he had a mind to “thrust a blade through his body” should he dare to be so presumptuous again. Evidently Braddock felt a bit sorry for going so over-the-top a few minutes later, especially since his young charge was looking pretty miserable, and even had a pillow tied to his saddle. So in his bluff yet slightly affectionate manner, he called his other aides over and made a general announcement that, although he had advised him to the contrary, young Washington had determined to make a local hero of himself and turn out as sick as a dog. Hence, it was their duty to look after the under-the-weather pup and make sure they were on-call to assist him. No doubt this embarrassed the proud young man, but he swallowed it the best he could, perhaps knowing that the general meant well, and it was his way of trying to patch-up his latest and greatest (thus far!) rant. But this was just the beginning of the ordeal. Along the Monongahela River, 10 miles from their destination, the British came into contact with the French and their Indian allies making a sortie from Fort Duquesne. Colonel Thomas Gage was the young British officer in charge of the advance guard. By nature mild-mannered and bookish, he had a knack for doing the exact wrong thing in combat situations. When he realized they were being surrounded by creepers in the woods, he decided for some bizarre reason that everyone should just STOP while he figured out the best-laid text-book solution to elude and/or counteract war-painted Indians shrieking and shooting from behind trees. Hence Gage ordered his column to stop…but failed to alert the brush-cutters behind them who crashed into the soldiers, causing total confusion, and more so as the other ranks behind the wood-cutters got entangled with them! By now, the British were hopelessly entrapped, and the French and Indians opened fire. It was doomed to be a massacre form the very start. One of the many tragic scenes taking place in the meantime was the death of Sir Peter Halkett, a high-ranking British nobleman and officer whose two sons were fighting under his command during the battle. When he was shot off his horse, his younger son went over to help him, and was himself shot and killed, with his arms still around his father. His man-servant then went to try to rescue both of them, and was also shot. His one surviving son would be haunted by this, and go off to find his brother and father’s remains several years later. He did discover their skeletons, still clinging to each other as they had fallen, and had them buried wrapped in their native Highland tartan. As the day grew late and the dead and dying littered the woods along the Monongahela River, Washington made a final desperate plea: this time that Braddock should call a retreat. The old general gazed at his decimated command and was overcome with the realization of what he had done. Finally his pride had been punctured, and he agreed to order a retreat. But just then a bullet smashed into Braddock’s side. Legend has it that it was fired by a colonial, whose brother had been cut down by Braddock for leaving his post. The general reeled in the saddle and fell to the ground, before he could give the word to pull back. Now Washington was the only one left to try and restore some sense of discipline and carry out an orderly retreat. He rode wildly along the lines as the bullets whizzed around him, tearing holes in his coat as he tried to direct the frantic survivors who had now decided it was every man for himself. The colonials were particularly fed up with their British counterparts, and hijacked officers’ horses to escape. They also were none-too-keen on helping Brits in any meaningful way to get off the battlefield. One badly wounded redcoat recalled that he had asked an American to help him. Instead, he presented his musket and shot at him, in order to “save him” from a worse fate at the hands of the Indians! Fortunately for the Brit, yon Yank proved to be a terrible shot, and the bullet ricocheted off the tree the wounded man was leaning against. The redcoat had already been sold a bum horse in America, and now decided never to ask help from an American again! However, he did manage to flag down a fellow Brit who rescued him at long last. Meanwhile, Washington returned to his fallen general, and with another officer started to carry him off the field. But Braddock now had something of an emotional break-down, realizing the full extent of the carnage. “I don’t want to live!” he groaned. Then he asked that he be given a pistol and left there to face the Indians with the others too badly wounded to run. He said that they would have a better chance of getting away without him. But Washington ignored the melt-down and helped get Braddock into the back of a wagon which was driven off the field. The bullet had penetrated Braddock’s lung, and although his breathing became labored, he still remained conscious and fairly lucid. He called Washington over and ordered him to go check on Colonel Gage, who was still back on the field. Washington did so, and was relieved to find Gage, wounded in the thigh yet still hobbling around giving orders. In fact, it seemed that Gage’s true talent for administrative organization had finally kicked in, and he had managed, against all odds, to rally the stragglers and survivors into an orderly formation. After Gage calmly assured him that everything was under control (“Keep calm and carry on”, what? ), Washington returned to the general. Again Braddock seemed distraught, and begged Washington to be his emissary and get through enemy lines to the nearest British fort in order to bring back reinforcements and much-needed medical supplies for all. It was a near suicide mission, but Washington, exhausted and increasingly ill though he was, did not hesitate, and galloped off through the woods. It was an all-night ride through the pitch-black wilderness, surrounded by hostile Indians on all sides, and it was a miracle he got through alive. Dismounting in the fort, he just managed to blurt out that the battle was lost, Braddock was dying, and help was needed immediately. Then he almost collapsed, and had to be ushered inside the fort and given a cot to lie down on. Meanwhile, the next few days of Braddock’s retreat elapsed. They were painful, lingering ones for the general. Sometimes he was coherent, and able to give orders. Sometimes he went into rants, repeating, “It’s all over!” and “Who would have thought it?” (Washington might have raised his hand then…but the subject was better not broached!). After a while the suffering from being jostled in the wagon became excruciating, and he had to be carried by two soldiers using his long ceremonial military sash as a make-shift stretcher. Finally, he declared that he would just remount his horse, and proceeded to ride along propped up until weakness overcame him, and had to be put back in the wagon. When the party finally paused for a rest, we can only imagine all the thoughts that must have assaulted Braddock as he lay gasping in his tent. The army had been his whole life. He had no family, and few friends. Who would remember him after he had gone? Who would think of him as a person, and not just identify him with the massacre at Monongahela where he had decimated his own command? British and Americans, soldiers and female camp followers, officers of the highest ranks and privates of the lowest, all had been cut down in the blood-bath, and were still being tormented by the Indians searching for scalps and booty on the field. Many of the captives would be gruesomely tortured and burned alive. Braddock must have known he would be painted as the butcher, the madman who refused to allow his men to save their lives by taking cover, and who had hacked them down if they tried. But would they ever think that that was the way he had been trained to keep his men safe? In Europe, it was stand together and fire as a force or be destroyed. But this was not Europe. And it was too late to go back now. The blood was on his head. He did not want to live to face the guilt, the shame, and dishonor of a trial in London. Why did they not just leave him where he fell? His thoughts must have turned to Washington. That young, impudent, stubborn little fool! He should have stayed to the rear instead of trying to show off. But he had done well under fire…marvelously well in fact. The gangly, sickly fellow had done the work of three aides, and remained staunchly at his post in the face of enemy bullets and Braddock’s own curses and insults. Did he hate him for being haughty now, as he was riding through the wilderness alone? Or was he lying dead somewhere, hacked apart by Indians, a final casualty of Braddock’s folly? No, not that! It mustn’t end that way! Perhaps Braddock had been unable to see it through the smoke of battle and the fire of his own pride, but now he felt…a twinge of a different sort of pride. A pride in a boy not his own. But he had no boy of his own to be proud of, to carry on his legacy, and honor his name. This one…this young colonial would have to do it. Braddock called over his loyal manservant and spoke to him kindly, telling him that he had seen enough of war in his service, and should take up farming in America. He said that he should now go into the service of Mr. Washington, and to be sure to take as good care of young man as he had taken care of Braddock. Then he instructed that his long scarlet ceremonial sash be given to Washington as well. It had once belonged to Braddock’s father, also a military man, and embroidered with the date he had joined the army, 1705. It had been given to Braddock upon the death of his father, to carry with honor. But Braddock had no son to pass it on to. The closest person to it was Washington. Then Braddock had two letters dictated. One was a report of the battle in which he exonerated the conduct of the officers (including Washington), but severely censured the conduct of the men. It was an old-fashioned fall-back in the aftermath of a disaster in order to preserve the authority of the leaders, allowing the lower ranks to take the blame for disorderly conduct. This was the age of the class system, and with it came breaches of justice in the name of preserving confidence for those in command and maintaining society. Braddock was complicit in this. The second letter was written to one of Braddock’s only “friends”: George-Anne Bellamy, a young actress back in England with whom he had a complex relationship. She was the illegitimate daughter of one of his old army comrades who had been abandoned by her vain actress mother and rakish father. Braddock had helped raise the girl, and they grew to be mutually devoted. Whether the relationship remained purely platonic or branched into something more upon her adolescence, she obviously loved him dearly, and he turned into an almost completely different person around her. His usual crusty veneer fell away, and he became as gentle as a lamb. Interestingly, George-Anne commented in her memoirs that she never understood why some people complained of Braddock’s rudeness, since he was always the epitome of sensitivity around her. In fact, it was said she was one of the only people who could get him to change his mind or show clemency to those for whom she acted as intercessor. Now, as he lay dying, he knew how effected George-Anne would be by his death, but true to his soldier’s code, he remained unemotional in his message, instructing that she simply be informed Braddock had died bravely at the head of his troops. Braddock’s last hours continued to be plagued with fits of delirium. The doctors who finally arrived to treat him realized he was beyond help, both because of his ruptured lung, blood loss, and his own death wish. It was hard for those around him not to pity him, even though many were embittered over his stubborn pride and unyielding sense of superiority that had cost so many lives. Perhaps they realized he was suffering for all of it inside. He knew what would become of his reputation, and the sheer magnitude of the human cost was not lost on him either. He had given up on life, and now prepared with befitting stoicism to face death alone. Seeming to seek some comfort amidst his raging thoughts, he murmured to himself, “We will know better how to deal with them another time…” And then he died. It was July 13, 1755. Washington returned to the British camp to learn that Braddock had left him his butler and his sash, and that it was his duty to perform the Christian burial rites for the general since the regimental chaplain had been severely wounded. But when it came time to deliver a eulogy, he found it hard to contain his own sizzling anger at what he had been forced to endure under Braddock, watching his Virginians butchered due to British incompetence and arrogance. Perhaps this was one of the defining moments of Washington’s life, realizing that he was different from the British, even as he was intricately bound up with them. So his eulogy was blunt and to point: Braddock’s good and bad qualities were decidedly mixed, and he could be arrogant, stubborn, block-headed, foolish, a rage-a-holic, and just plain rude! But still, he admitted, he was also brave, honest, and generous to those whom he favored. There was a definite edge in his tone, nonetheless, and when Braddock was laid in a common grave below the road so the Indians could not mutilate the corpse, few believed Washington had buried the hatchet. He proved this by joining the throng of Braddock detractors in the aftermath of the battle. Washington’s criticisms became so scathing at a certain point that one of Washington’s friends who had also fought under Braddock wrote him a letter begging him to cease and desist. This friend remarked that he had never expected him to join in the cat-calls against their old chief, even though the man’s character was being dragged through the mud in almost every newspaper across Britain and the colonies. After all, he said, Braddock himself had not been one to sully another man’s reputation behind his back out of malice. If he wanted to take them to task, he would do so to their face. He may have been rough and rude at times, but he cared about honor. He also cared about Washington. He may not have always known how to express his feelings, but he did. People were callously saying that Braddock’s death was of no consequence to anyone, that that he was as good dead as alive; now his friend begged Washington to break the painful trend. The fact was that Washington was struggling to make sense of his own mixed emotions. There was no doubt that he had come to love his old mentor too, and the anger at being mistreated by him on the battlefield stung all the more because of it. His own father had died when he was but a boy, and his beloved half-brother Lawrence, who had been an officer under the command of British Admiral Edward Vernon, had recently succumbed to illness, leaving him his manor of Mount Vernon. Washington had yearned to find his place in society as a British officer, only to meet with a series of red-tape hold-ups and self-inflicted disasters. What hopes must have been aroused when he was selected by General Braddock to be his aide! At last, he must have thought, his dream of recognition would be realized. And yet at Monongahela, the young American realized that he would never be allowed to become what Braddock was…the impenetrable walls of the class system would never allow it. Braddock would not heed advice from him because he was a “mere colonial”, and Washington knew he would be doomed to remain a second-class citizen forever if he remained within the British sphere. His high spirits and manly ambitions could not stomach that. This was exacerbated by Braddock’s own blazing temper directed at him. For Washington, it was the feeling of being rejected by two parents: one was his semi-father-figure Braddock, and the other was Mother England. With all these emotions raging, Washington had to watch Braddock shot. No matter the suppression of the class system, the plausible father-son antagonism, or the horrors of the hour. To watch the man he had assisted day in and day out, who had often shown him a gruff yet sincere kindness, and who had proven himself to be a brave if fatally stubborn man suffocating with blood gushing from his lung must have shaken him to the core. And then he had been given his blood-stained sash, the symbol of his mentor’s honor, and the honor of his father before him who had served king and country. The implications were deeply profound, and were not lost on Washington. For Braddock, it had been an act of passing the mantle, and saying in one gesture all the things he had been unable to put into words before the end. In spite of his initial verbal hostility to his late mentor, Washington took the sash and put a place of honor in Mount Vernon. But when he was called away from home on his travels, he always took the sash along with him. Even after he had joined in rebellion against the British and became commander-in-chief of the Continental Army, he still kept this heirloom from his old British superior among his personal belongings on his many campaigns, and brought it safely back home with him again. What were his reasons for keeping this tangible link to the past so near to him at all times? Perhaps it is one of the more unique demonstrations of that “special relationship” that Britain and America have always shared, and always will share. Some roots run too deep for anything to pull out. Avellina Balestri is a blessed-to-be-Catholic homeschool graduate from Maryland, USA. She has long had a fascination with British history and culture, originating with her interest in Robin Hood and devotion to the Catholic English Martyrs. She reads and writes extensively on the subject, and has established various international contacts via email correspondence, phone calls, and snail-mail parcel swapping. She also did a stint of political activism for the Unionists during the Scottish Independence Referendum. Her other sources of enjoyment include reading musty historical tomes, listening to Celtic artists such as Loreena McKennitt, and watching classic films such as A Man for All Seasons and TV shows such as Kung Fu. She also sings, composes, and plays the penny whistle and bodhran drum. Avellina is proud to be among the founding "Three Musketeers" of the online magazine The Fellowship of the King (under the alias “Rosaria Marie”) and work as its editor-in-chief. Written content of this post copyright © Avellina Balestri, 2016. Jane Austen, Brighton and Me!